When your hard drive crashes, it's a scary thing. But in most cases, in spite of appearances, your data is still intact. To destroy all of the data on a hard drive permanently generally requires nine or more passes with a "drive wipe" program, and/or boring several holes through the hard drive with a drill press. Some of your data may be gone for good, but a number of hard drive recovery methods can retrieve the overwhelming majority of it. You can recover hard drive data in most cases. Pay attention to what your computer tells you when it tries to use the hard drive. If you see a stark screen telling you the hard drive is "missing," the problem may be as simple as a loosened cable. Power down, open the system unit case, unplug, and then re-connect the drive's data and power cables. Hard drive crash recovery is sometimes that simple. If the error message says the "MBR" is "missing" or "operating system not found" then the hard drive is working but the Master Boot Record has gotten corrupted. It happens for any number of reasons; a passing cosmic ray can corrupt data stored on magnetic media. All you have to do is rebuild the MBR. The MBR is the first file that your computer reads when it's turned on or re-booted. It's a tiny file stored in the first physical sector of your hard drive. It tells the BIOS (Basic Input/Output System) where to find the operating system (Windows, Linux, Mac OS, etc.) and other information necessary to booting up your system. If the MBR is damaged, you're stuck until it is rebuilt. See my companion article Fix MBR for help with that task. It's not as geeky as it sounds, and it can save you the time, trouble and expense of replacing a hard drive. If the MBR is OK then the operating system may be corrupted. In Windows, there are some utilities you can use to diagnose hard drive crash causes without being able to load Windows itself. See my related articles Windows XP Repair and Repair Vista or Windows 7. It's also a good idea to make a System Recovery disk when you don't need it. This is a bootable CD or DVD (or even a USB flash drive) that contains essential operating system files and tools for diagnosing and repairing corrupted data on a crashed hard drive. Harddrive data recovery software can be used to rebuild corrupted application program and data files, if the operating system files are working all right. EASUS Data Recovery Wizard is a $56 commercial program that makes data file recovery as painless and foolproof as possible. You can download a trial version that will recover up to 1 GB of data free of charge. If hard drive crash data recovery software doesn't do the trick, you may need a professional data recovery service. Yes, you can find them in the Yellow Pages or online. These pros know every trick of recovering data from crashed hard drives. They also know that extreme data recovery efforts take many hours and are extremely valuable to the person who wants the data back - so a data recovery service is sometimes more expensive than buying a replacement computer. Online College Or Campus College? Most recent comments on "My Hard Drive Crashed!" My harddrive was password protected. It crashed and I took it out and installed it in a external drive port. When I plug it in to my new computer it sees the drive but I can not access the files. How to you enter the password ? I have recovered data from a non-booting HD by putting it in the refrigerator over night. After reinstalling you may have enough time before it heats up to back off some of your data files, but you have to work quickly. I'd like to give a plug for Gibson Research Corporation's "SpinRite." I've used it nearly a dozen times over as many years to successfully restore corrupted HDDs that fail to boot. It also works great on TIVO & iPod HDDs. When all else failed, I opened the computer case and took out the CMOS battery. It looks like a small fat quarter (of a dollar). After I put it back after half an hour, I was up and running. Here's a another tip: On my home desktop, the hard drive goes "missing" if the battery on the motherboard runs out. Took me a while to diagnose as in other respects the machine seems to be trying to boot and failing somewhere in what used to be autoexec.bat when I was growing up. Twice I have simply removed the hard drive and installed it in an external USB case that can be purchased for $40. I then purchased and installed a new (and bigger) hard drive and re-installed Windows. Runs like new and all my data is accessible from the now external USB Hard drive. Bob, for a Mac, I can't praise Data Rescue 3 enough. My Daughters iMac G3 stopped working some weeks ago. I replaced the disk and re installed the OS just fine but using a USB interface to the disk, nothing I tried would find any of the data until I tried Data Rescue 3. Not only that. The user interface is a pleasure to use too. You can try it for free and though it might be more expensive than some other solutions, it was worth every penny. @George: I also used to password-protect my hard drive. I had a motherboard failure recently; the new motherboard recognized my drive but refused to boot my system. My advisor, a Level 3 Helpdesk PC tech for a major company down south, tells me that password protection causes a hard drive to be encrypted and that it's motherboard-specific. Change the motherboard... lose the encryption key. 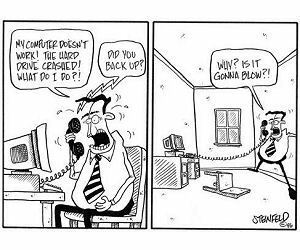 Did you have an external backup of your key files? External backups won't be encrypted (unless you've password protected _that_ hard drive as well). For those mentioning hard drive enclosures, if you are using a SATA drive, you can buy a hard drive dock. You can get USB or USB/eSATA, but basically it's not an enclosure, you just plug your bare drive in. Cheaper than an enclosure and perhaps more useful afterward. I'm using one on my desktop with Cobian software for nightly backup. I, too, just ran into the "unplugged cable" problem on my wife's PC. Didn't look unplugged, but pulling the IDE cable and putting it back did the trick. Don't know what happened, I wonder if the continuous tiny vibration of the running drive can cause the IDE cable to slip a little. Hard drives can mean to frustrate at times and this comes when they crash and data is lost.My hard drive crashed a week ago and i lost all my data.I was so fortunate that i did not lose everything because i had some of my data backed up with an online backup called SafeCopy online backup.This online backup system offers a free unlimited 3GB trial version and they are cost effective. I have a couple of hard drives that I have much data on, and have been using. Now, suddenly they are not recognized by my BIOS, or my operating system. Its like they are not connected, although I know that they are, and are running, as I can feel both the heat, and the vibration. is there a program, that will recognize these drives, so I can at least remove the data from them, or get them to boot up and be usuable again? EDITOR'S NOTE: Try connecting them as external drives via USB. Well if my comment does not appear this time again then am doomed.Well i think with hard drives,one must always have backups somewhere and this can either be on another hard drive or online.But it is always advisable to use online backups because with hard drives anytime they can crash and this results into loss of data or files.Well i use safecopy online backup for all the backups i need. Hard drive crashed and I'm having difficulty finding my email on a hard drive that was taken out of my old pc. I'm using a USB 2.0 Universal Drive Adapter and I've been able to backup everything I've needed to except my email. I get as far as "Documents and Settings/$user" and cannot find Application Data (was told emails could be found at "Documents and Settings/$user\Applilcation Data\Microsoft\Outlook". I could kick myself for not backing these up when I had the chance. I would really appreciate any help you can give me. Thanks so much! any comments on HDD Regenerator, the software that claims to regenrate bad sectors..? Hi Bob, recently my Western Digital 1 TB external "My Book" crashed and where the not even the drive letter was recognized. I used Easeus Data Recovery Wizard (Free) and it found all the files but they were corrupted. I made a MS notepad copy of the report. I then called a computer guy who did the same thing with a different program but all the files he recovered open up but they're just blank word, Pdf jpeg & excel doc's etc. He reformatted the drive stored these "empty" files on it in a folder he created. Aside from potentially spending big bucks with a pro service, where to from here please? Many thanks indeed for any pointers. Kind regards.